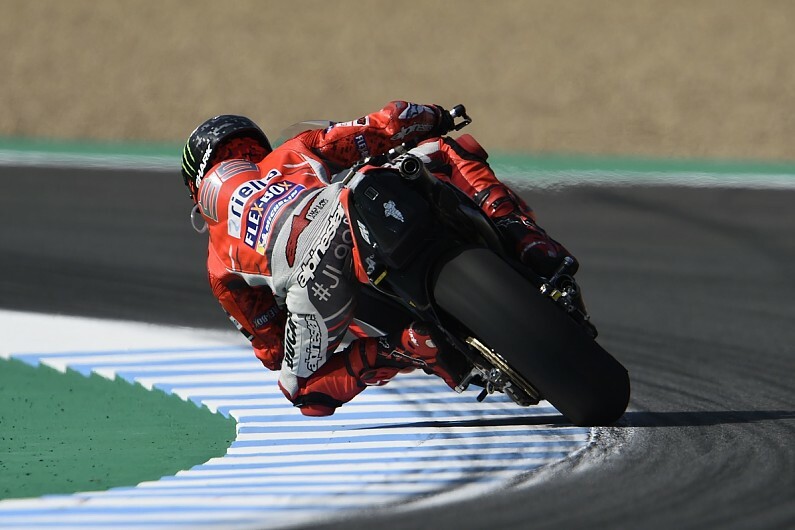 Ducati's Jorge Lorenzo says the new parts the Italian manufacturer has brought to Jerez have given him "a bit of happiness" after a miserable start to his 2018 MotoGP season. Lorenzo has struggled to gel with the latest version of the Ducati Desmosedici and has picked up just six points from the first three races of the year. Ducati arrived at Jerez with unspecified updates, with a modified seat unit thought to be among them. Andrea Dovizioso "didn't try anything new" on the first day of running, but Lorenzo did - and said the new parts took the GP18 "a little bit in the direction that I want". "We are trying new things on the bike, [as] Ducati brings some new parts here," Lorenzo explained. "They worked well today, making the bike more smooth with the throttle in the middle of the corner and the acceleration. "And this goes a little bit into the direction that I want for that bike, that we lose a little bit with the new bike. "[We] have improved in some areas, in stability, in smoothness, in exit of the corners. "That's why today this give me a little bit of happiness." Lorenzo, who has had plenty of success at Jerez over the years, was only 15th in opening practice, but improved to seventh in FP2 - and felt he had the pace to end Friday in a higher position on the timesheets. "In the morning I didn't put the new tyre on - so I put it on from the beginning of the second free practice, but the first soft tyre on the rear was not good for me, so I couldn't be much faster. "When I put the [medium] rear tyre, I improved by one second. So, the middle tyre has much more grip than the first soft new tyre - this is not normal. "Then I put another soft tyre on at the end, and I improved the laptime. "It was a pity that on my last lap [I] missed one gear, so I lost the lap because [of] this mistake. I was quicker and could be maybe top five." Lorenzo added that while Honda riders have dominated proceedings at Jerez and were "favourites for the race", he felt he could bridge the gap with set-up changes for qualifying on Saturday. "The important thing of today is these pieces that Ducati brings that makes my life more easy, I'm confident and positive about that," he said. "And if tomorrow we can bring that setting that makes the bike turn more in the second part of the corner, we can be much closer to the Honda guys who are the fastest ones here."